I’m going to try this with a slightly more cogent approach this time. 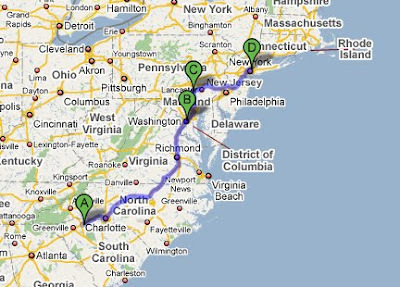 I’m thinking March: South Carolina to DC/Baltimore to PA to Manhattan. The plan is to have two teaching days in each city: one day of private lessons, one day with a group class, with another day for seeing old friends, meeting other cellists, and checking out the scene. I’m also looking for sponsors. Based on my last trip, I’m going to contact the companies that made things easy for me. Short of getting a tattoo, I’ll do any advertising a rental car company, airline (the one I love rhymes with Get Glue) or other benevolent provider of money, goods or services asks me to do! The only thing that prevents me from doing more tours is lack of sponsors! The tremendous support and organization of readers, teachers and cello clubs always helps me find plenty of wonderful, enthusiastic cellists. Then I’m thinking May, Midwest. MO, IA, MN. Straight shot due north. Maybe some Indiana to visit the wonderful Mimi Zweig. Oh yeah. An Emily Trip on the East Coast. Now, that's motivation to practice. OMG OMG OMG! This is SO great! Emily in the D.C. area in March – wooo hoooo! You're starting so close to Atlanta that you may as well come by here. We would love to see you again. Anything I can do to convince you? I'll find us a fun wine bar? I'll second that invite to Atlanta! and how could you fly east and NOT go through Atlanta? I missed you on your visit last year- what else can we do to entice you? Atlanta-ites: I would love to come see you guys again (and some of you for the first time!). It will all depend on my teaching schedule in LA (I don't want my students to miss two weeks of lessons) and how many people I can draw to each location. If I can't get enough participants in NYC, then maybe it would go SC-Atl-PA-DC. I still think fondly about my snowy trip earlier this year! I gotta figure out a way to get Shar to sponsor you in a visit to Michigan during your midwest trek! I'm in Muncie, Indiana just a ways north from Mimi in Bloomington. Let me know if you'll be in the area; would be great to meet you! Speaking of Indiana, Greencastle is close to Bloomington, so you could visit Mimi AND Eric (me)! Count me in if you come to New York!